Grades might be the death of me. Not grading — I can handle that. It’s my students’ obsession with grades that is beginning to break my already aching back. Right after we’d spent 75 minutes of our 85 minute class period color-coding our best drafts and revising what we thought was pretty good writing to craft better writing, a student — we’ll call him JWP — asked me if I would read his essay. I thought he asked for a writing conference. “But, you haven’t done anything with the ideas you got in the discussion today,” I said. I can feel my breathing change. I sigh. “I am happy to read your essay,” I said taking the paper, noticing the green and red marks from our color-coding session but no blue, orange, or purple. I tried to think fast, not sure of the best way to bridge the obvious gap: Writing for a grade versus writing to convey meaning because we care about our message and our craft. I guess I’ll know if what I said made a difference when JWP turns in his essay today. How do we get students to care more about the learning than about the grades? I believe it has to do with helping them change what they might believe about school. This is hard. My students are juniors in high school with 11 years that have shaped their beliefs. Somehow I have to get them to want more. The aha hits me: These habits of mind are what my readers and writers workshop instruction is all about: a “way of approaching learning that is both intellectual and practical and that will support students’ success in a variety of fields and disciplines.” At least I try to make it so. 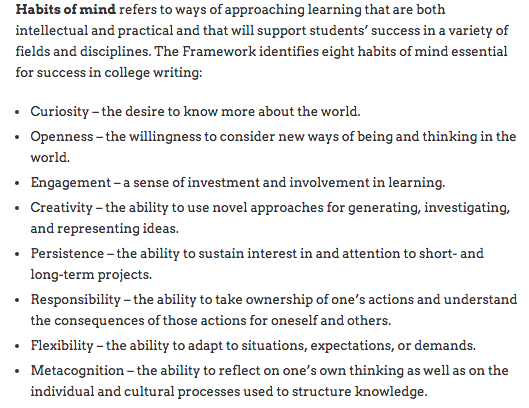 My students need these habits of mind. They need them so they can be successful in college and careers years after they leave my classroom. They need them if they are to be the change agents in the workplace and the world they inherit. I am persistent. Little by little we embrace this thinking in my classroom. I keep inviting and encouraging. I meet with my learners to help them think through their thinking, conferring with every student as often as I can. We explore different texts we can write and different authors we want to read. We talk about our reading experiences. We share our writing and our writing processes because everyone has a different way of practicing their craft. We discuss complex texts and practice complex thinking. We choose projects that challenge our comfort and lead to deeper learning. Many students quickly adjust to the freedom and uncertainty of workshop. Others struggle. Like JWP. He’ll get there — we have until June. Do you have JWPs (Just Wanna Pass) or, on the other end of the spectrum, those students who grub for grades? How do you deal with the grades over learning conversations? Please leave a comment and join this conversation. I am regularly asked by students if they can redo things. I always ask why are you redoing it? And the usual response is, “because I don’t like my grade.” I understand that moment when your breathing changes. I also just read a fabulous article on the Huffington Post this morning that my husband shared with me. Here is the link: http://www.huffingtonpost.com/jp-fugler/your-child-is-not-special_1_b_8277996.html. Amy, the struggle is real. Educators can be the same way. I encountered this question from an educator friend recently, “Why do we still need to teach narrative writing? We know 100% the STAAR writing prompt will be expository”…sigh. I will be reposting your blog about the importance of narrative writing soon.